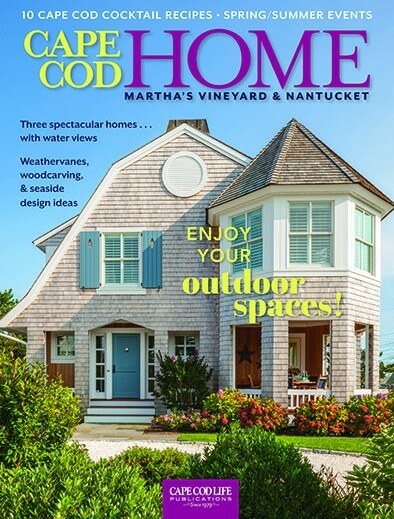 In 2016 we are revisiting some of the homes featured in Cape Cod HOME’s first issue in 1996. This residence in North Falmouth’s picturesque Ballymeade Estates was featured on the cover of Cape Cod HOME’s inaugural issue in 1996. Though architecturally the 3,500-square-foot home has remained largely the same over the years, some significant changes have been made to the interior, including a complete remodel of the master bathroom and the installation of a new roof and darker, hardwood floors throughout. Another change? Since September of 2014, the owners of the home are Bruce and Lisa Wilby. The couple’s yellow Labrador, Rose, poses in the photo above.